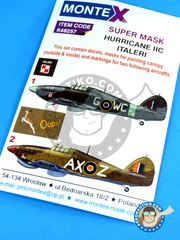 So, bring lots of water because here are a few new masks and decals sets by Montex Masks, all of them for World War II machines: Hurricane, Spitfire, Corsair, Bf109, Corsair, Ki-84, Ki-27, Ki-43, Mustang and Aircobra. 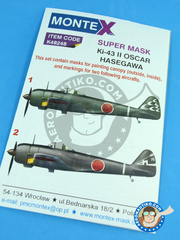 And a late time arrival: the A6M Zero 5 Zeke by Tamiya, commemorating the film Eien no Zero. There's nothing better than a quick and refreshing dip into Aeronautiko novelties, isn't there? 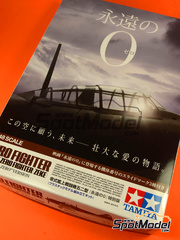 This kit belongs to a special limited edition celebrating the release in 2013 of the japanese film "Eien no Zero" (The Eternal Zero), participated by Tamiya and starring the famous Zero fighter. Inside the box, you have 3 different decorations to recreate the different planes on the film. 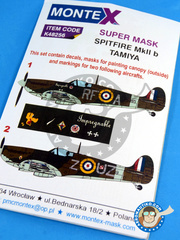 Set of paint masks and decals for recreating either the SAAF unit operating in Egypt 1942, or the RAF unit just like it flown on June 1944. 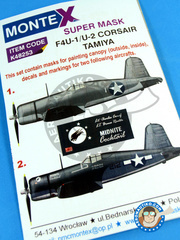 Paints masks and decals set for recreating either the RAF unit flying on May/June 1941, or the unit operating in July 1941. Set of decals and paint masks for decorating either the unit flying at Guadalcanal on July 1943, or the unit operating at Saipan on April 1944. 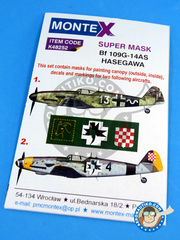 Set of paint masks and decals for recreating either the unit operating at Italy in April 1945, or the unit operating that same year from Nellingen. 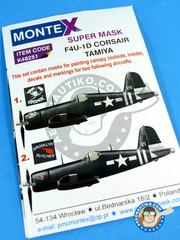 Decals and paint masks set for recreating two of the units aboard the USS Gilbert Island on July 1945. 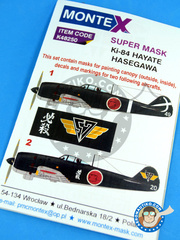 Decals and paint masks set for Hasegawa kit. The included decorations belong to a Shimodate airstrip unit in May 1945, and another unit from the same year at Nanking. 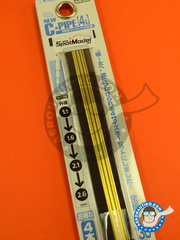 Set of 130mm long tubes, in four different diameters (1.5mm, 2.0mm, 2.5mm and 3.0mm) designed to fit one inside each other, which makes them perfect for modelling dumpers, all kind of bars, etc... in your scale model. 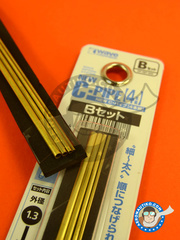 Set of tubes in four different diameters (1.3 / 1.8 / 2.3 / 2.8 mm) and 130mm long each designed to fit one inside the other, which makes them perfect for modelling dumpers, all kind of bars, etc... in your scale models. 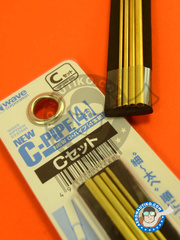 Set of tubes in four diameters (1.1 / 1.6 / 2.1 / 2.6 mm), in 130mm lengths. They are designed to fir one inside the other, making them perfect for modelling dumpers, all kind of bars, etc... in your scale models. 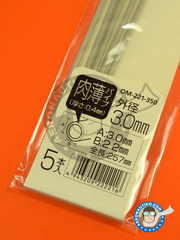 Round grey plastic rod 250mm long and 1mm wide. Each package includes 8 units. 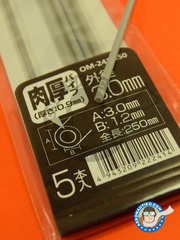 Grey plastic pipe 250mm long, with an outer diameter of 3mm and inner diameter of 1.2mm. 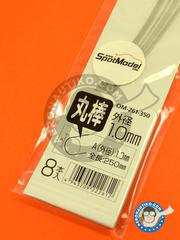 Grey plastic pipe 257mm long, with an outer diameter of 3mm and inner diameter of 2.2mm. 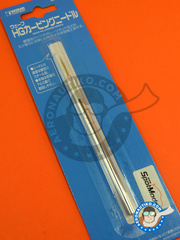 A top quality metal carver for panel scribbing. You don't have one yet? 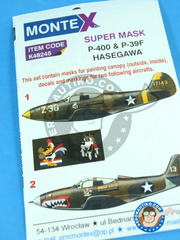 Paint masks set for recreating the Oscar version flying at New Guinea in March 1944, or the unit flying at Tokyo in 1945. 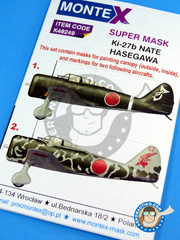 Paint masks set for recreating the Nakajima green unit flying at the late Second World War, or the camouflaged unit on summer 1939. 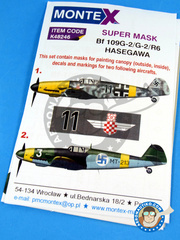 The set includes 2 masks sheets and 1 decals sheet for recreating the unit of the Finnish air forces piloted by Capt. Hemmo Leino in June 1944, or the unit flown on June 1944 by Oblt. Kurt Gabler. 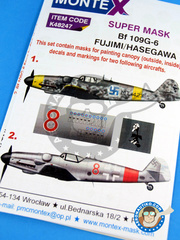 Set including canopy and markings paint masks and one decals sheet for recreating Major Vladimir Ferencina's unit during August 1942, and the Finnish Air forces unit piloted by LT. E. Riihikailio on early 1944. Two gorgeous decorations here for the P-39. The set includes two masks sheets and one decals sheet. 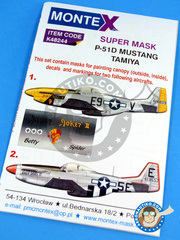 Nothing less than 3 masks sheets and one decals sheet for recreating the gorgeous P-51 from the US Air Force.